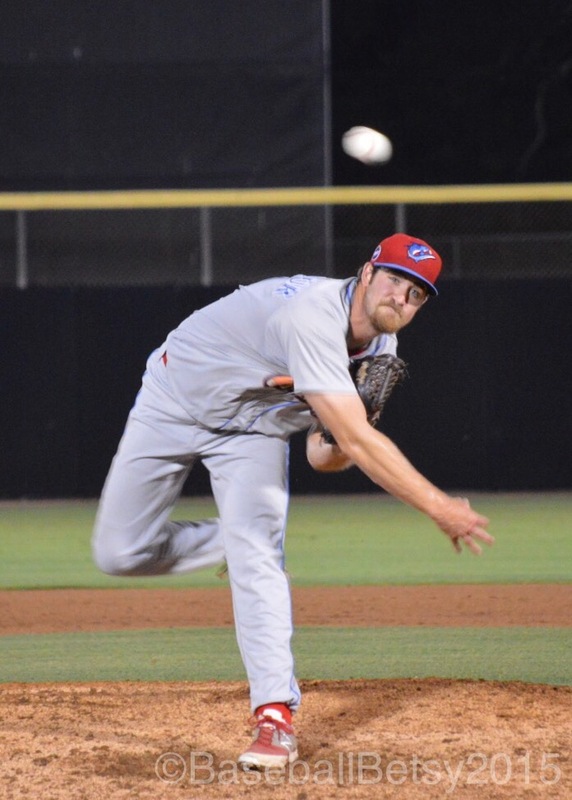 Colin Kleven put together his best performance of the season so far as he lead the Threshers to an 8-1 win over the rival Dunedin Blue Jays. Willians Astudillo, who caught tonight, and first baseman Zachary Green each had two RBIs to aid in the run total. Also key to the win were three base hit for both second baseman Drew Staniewicz and center fielder Chase Harris. The key to the game was the stellar performance of Kleven. Kleven was solid over his six innings and had a no hitter going for 4 2/3 of those six innings. He also held the Jays to a run on three hits over six innings while striking out six. 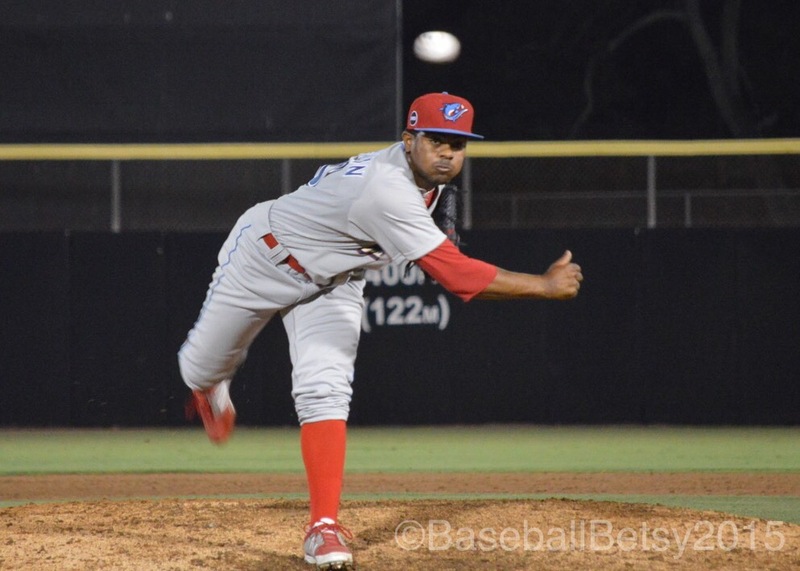 Coming in the seventh was LHP Harold Guerrero, who pitched two innings with two strike outs, two hits no runs. Will Morris, LHP, came in to close in the ninth giving up one hit and had one strike out. I mentioned on opening night how special this team feels, so different from last years’ team. 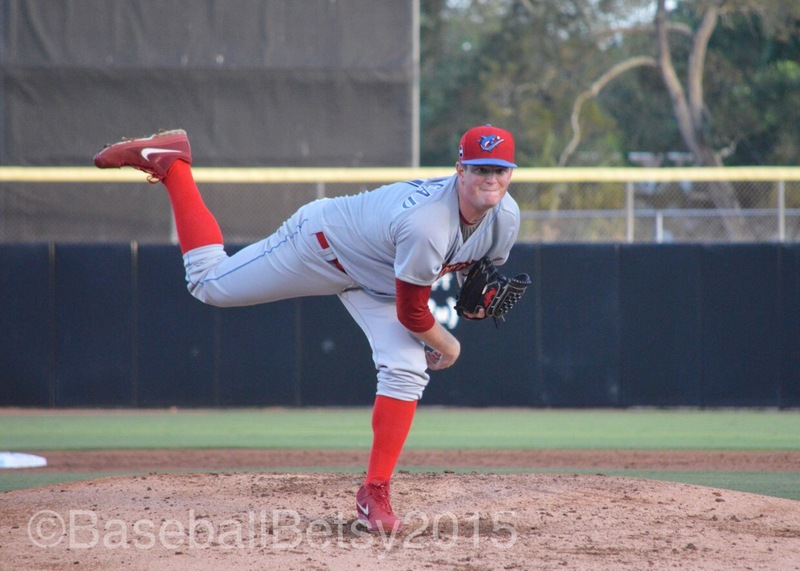 The 2015 Threshers feel like there might be lightning caught in a bottle. The first game of the season they turned a triple play. Last Saturday they were down and summed up the energy to walk off and win on a single by Willians Astudillo. Last night, it was something special, again. Two weeks into the season and this team is playing with more heart than all of last season. I’m gobsmacked. No longer do they fold when they are down, they keep fighting to the end and it’s playing off in spades. Last night, Andrew Pullin tied the game at 3 in the bottom of the 8th with a home run that was well over the right-center field fence. It amazes me how much fight these guys have. It would remain tied at 3 for NINE more innings. Yes, NINE. They played an entire game in order to win and win they did. The game was started by Miguel Nuñez, who had a solid start of 5 innings. Threshers were trailing 3-2, but this is NOT last year’s hang-dog team, you know they will fight until the end. Then in was Lino Martinez. He held it together for two innings. Next up was Lee “Rocket Arm” Ridenhour–who warmed up to Elton John’s “Rocket Man”. Ridenhour had three sharp, shut-out innings, keeping the Threshers in the mix as Andrew Pullin tied it up in the 8th. At the end of 10, it was still tied. Next in was Edubray (Ed-ooo-bray) Ramos. Ramos has been near-perfect this season and contributed 3 innings, 2 hits, 1 walk and 4 strike outs. Cody Forsythe came in at the top of the 14th. He was a champ. So impressive. Forsythe would go on to pitch four innings in relief. Manager Greg Legg has confidence in Forsythe and didn’t even start to have some one up in the pen until midway through the 17th. Forsythe would go on to: 4 innings, 2 hits, no runs, no walks and 6 strike outs. An amazing performance by any standards! Bottom of the 17th, with one out, Brodie Greene singled then was “balked” to second. The Tigers then intentionally walked Pullin. Jose Mayorga then walked to load the bases. Next up, Dylan Cozens hit a single into the hole between first and second scoring Greene to win the game! 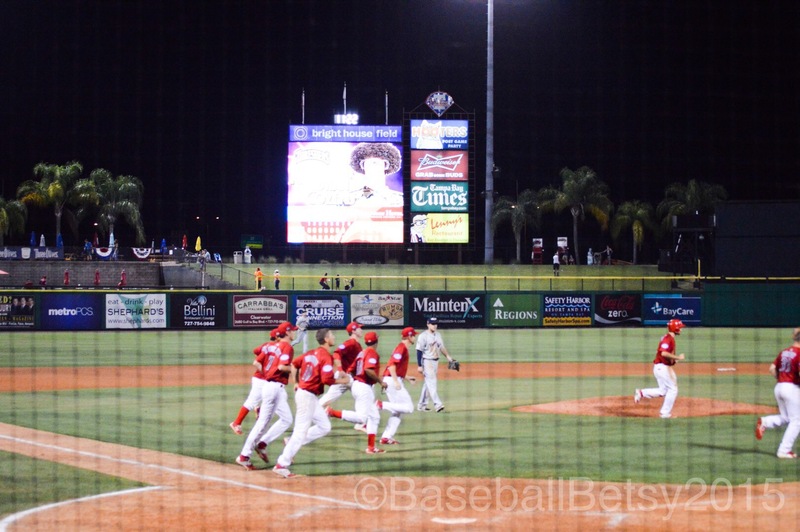 The Threshers win! What a game! It was finally over at 11:30. I was so glad that we had stayed until the end, though my little car looked lonely in the parking lot. 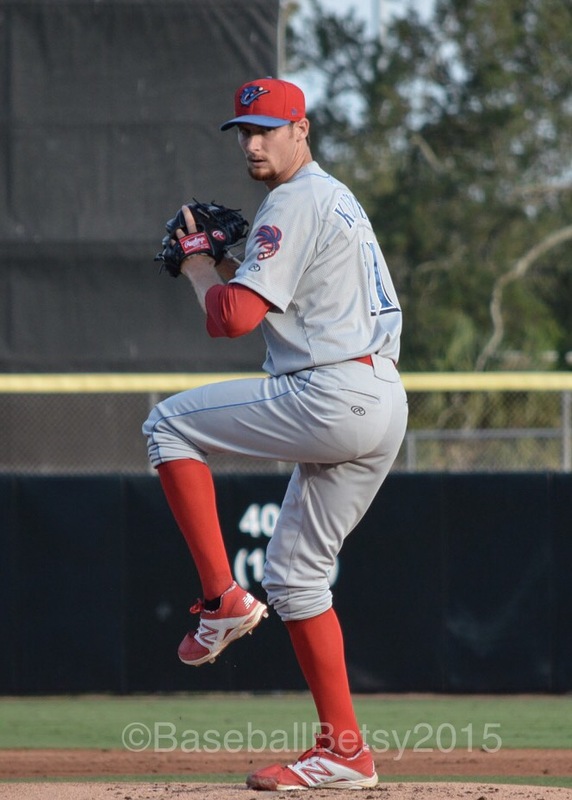 When I wrote about the introduction of the Clearwater Threshers earlier this week, I mentioned how this year’s team has character. Then on opening night, they turned a triple play, playing as if they had been together for years. It’s not an easy task, but they did it. I was talking with one of my player friends and he agreed that this year’s locker room is good, that everyone is getting along and they have fun together. To me, this is key. You can have a talented team but if they players do not get along, they could have all the talent in the world but they still won’t win. Conversely, you can have a team that may not be as talented but they will win simply because the chemistry will give them the extra “oomph” they need to win. That being said, I think this year’s Threshers might be the rarest kind of team-the one with the talent AND chemistry…time will tell if my feeling about this team will pan out. Brandon Leibrant only gave up one run to the Dunedin Jays in the first. Andrew Knapp tied the game in the third and the game remained knotted at one until the bottom of the 11th. Dylan Cozens hit a single but the Jays short stop overthrew first and Cozens took advantage and made it to second. He was almost stranded as Zach Green struck out and Aaron Brown popped out. With two outs, catcher Willians Astudillo stepped to the plate. He smacked the ball…EXACTLY where it needed to be, right into the gap between the second and first basemen, allowing Dylan Cozens to score from second. Not only did the crowd go wild, the team stormed the field to celebrate! Baseball Ross has video of the winning play and celebration. You can see it HERE. 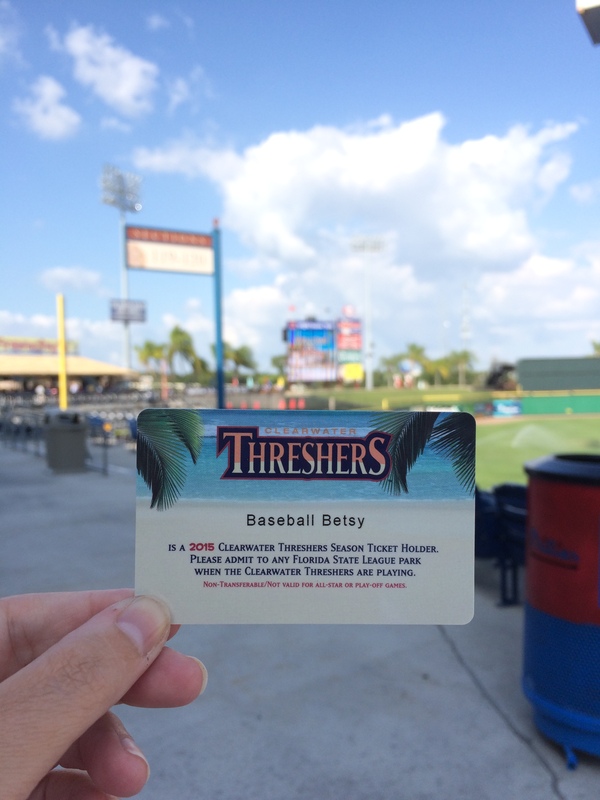 The Threshers never seemed like they were going to give up. There was never a feeling that they wouldn’t win, it was just a matter of time. It was a very different feeling from last season. Wawa (the convenience store) gives out free coffee coupons for extra innings and dollar off “Shorti Sub” coupons for wins…last season (the Threshers ended the season 40 games under .500) we sadly got more coffee coupons than sub coupons and I don’t believe we ever got both for an extra innings win. So lunch today is lunch is courtesy of the Threshers! Cheers! It was another beautiful night in Clearwater. Perfect weather and everyone was excite to start the season on a good note after last year’s fiasco of a season. While the final score was not what the crowd wanted, a 5-2 loss to the rival Dunedin Blue Jays, there was a lot of good to take away, a little bad, and some ugly. Andrew Knapp went 3 for 4, including an RBI single. Aaron Brown and Andrew Pullin both had hard-hit doubles. Mark Leiter, Jr., making his debut as a reliever with two strike outs, including rehabbing Toronto Blue Jay, Michael Saunders. Edubray Ramos got Michael Saunders on a broken bat ground out to Mitch Walding, who threw out Saunders at first. The game was lost on three home runs, with each pitcher, Matt Imhoff, Mark Leiter, Jr. and Edubray Ramos giving up one home run. The Threshers were 1-8 with runners in scoring position. 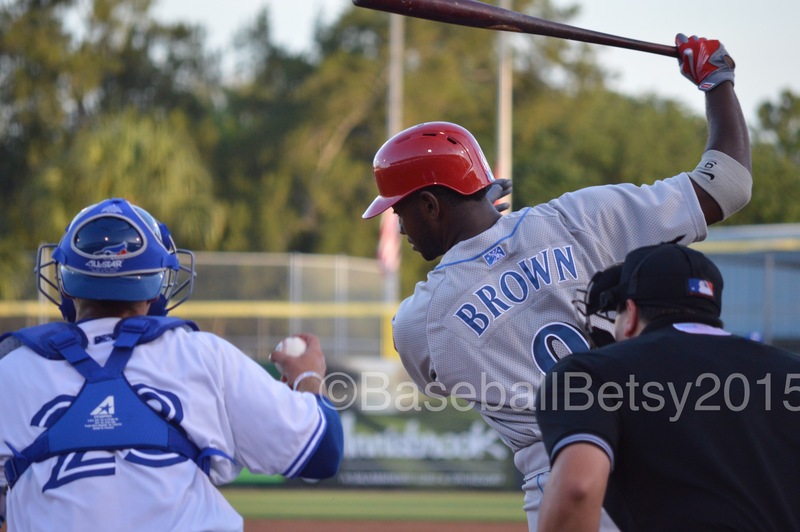 Domonic Brown striking out during both of his plate appearances. I’d also like to give a shout out to Threshers’ General Manager John Timberlake for a moving rendition of “God Bless America” in dedication to Chuck Murphy, former Florida State League President who passed away a month ago. It was a truly heartfelt tribute.